Scrimshaw is done on ivory and there’s no substitute for it. Some scrimshaw artists use other materials but there is Something about ivory; it’s just made to Scrimshaw, carve and create art. I only do large display pieces that take countless hours, so I don’t waste my time on artificial materials. Scrimshaw artists use small pieces of ivory that generally cost from $50.00 to $200.00 a piece; but when they’re complete, the value can run into the thousands. If the Scrimshaw artist uses an artificial material however, very few collectors will pay because it isn’t on a nice piece of ivory. Sadly most countries have bans on ivory, so we have to work with what’s available. If you don’t mind and your country allows the use of elephant ivory, whale ivory or walrus ivory, use it whenever possible but make sure to keep the paperwork showing where and how you bought it – you never know when you might be asked for it. Because of these restrictions, the use of elephant, whale or walrus ivory is being phased out by most Scrimshaw artists. To avoid the hassles of new ivory I turned to using fossilized mammoth and walrus ivory. Fossil walrus ivory, even though it might be hundreds or thousands of years old is restricted in Australia and needs a CITES permit to be exported from the US (the only place it’s readily available) into Australia. It comes mainly from Alaska. 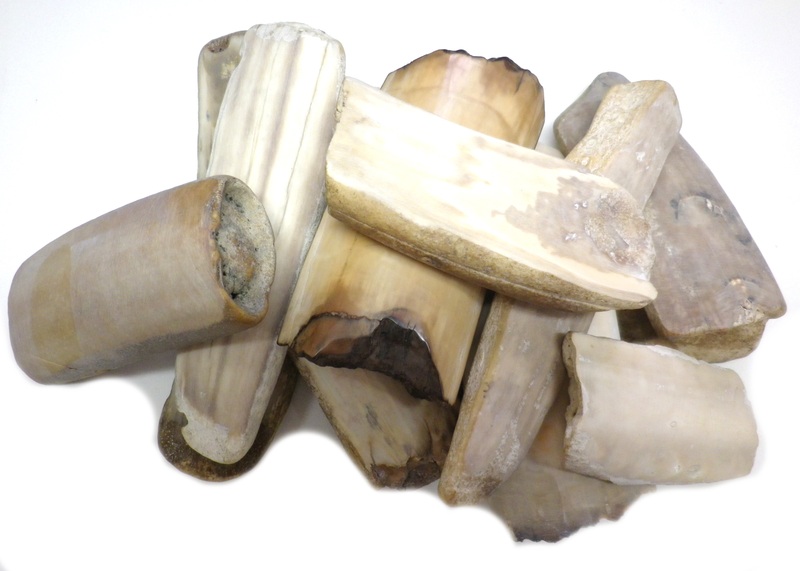 Fossilised Walrus Ivory, Excellent For Scrimshaw If You Can Get Good Quality Ivory. Fossil walrus ivory is very difficult to buy and import into Australia. Be very careful when shopping around because most suppliers won’t sand down the surface to show you what the ivory really looks like underneath. My advice is to avoid buying this kind of ivory if they refuse to sand and polish it. Finding a piece that suites you is a challenge and can become very pricey. You also have to apply for a CITES permit which you can’t do from Australia. This takes about three weeks. Then it has to be examined by a customs inspector at a designated port of departure. It then is sent to Australia. After the amount of hassle involved I decided never to buy fossil walrus ivory again. If you live in the US however, it’s quite easy. Fossilised mammoth ivory is free of restrictions and can be imported and exported in Australia without the need for any permits. This is my favourite type of ivory. 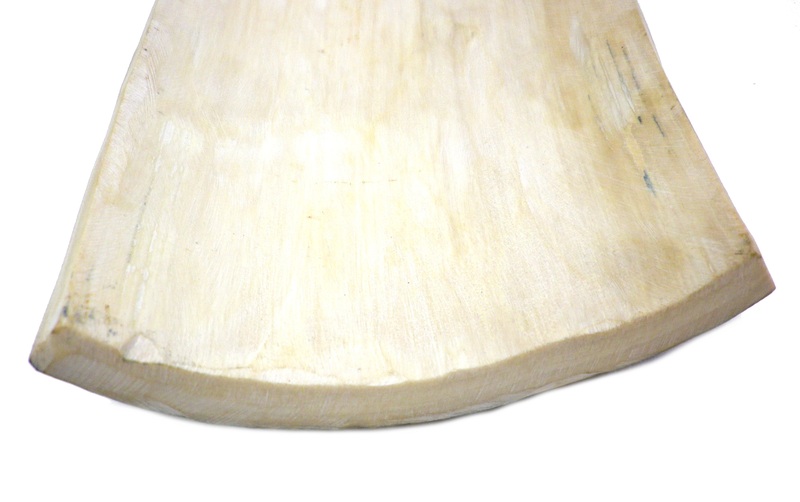 Large pieces are available and if you choose carefully, there are beautiful creamy sections that scrimshaw very nicely. Fossilised Mammoth Ivory, In My Opinion The Best For Scrimshaw. I get my mammoth ivory from Sergey at “Gouralnik Import-Export” www.mammothivorytrade.com. 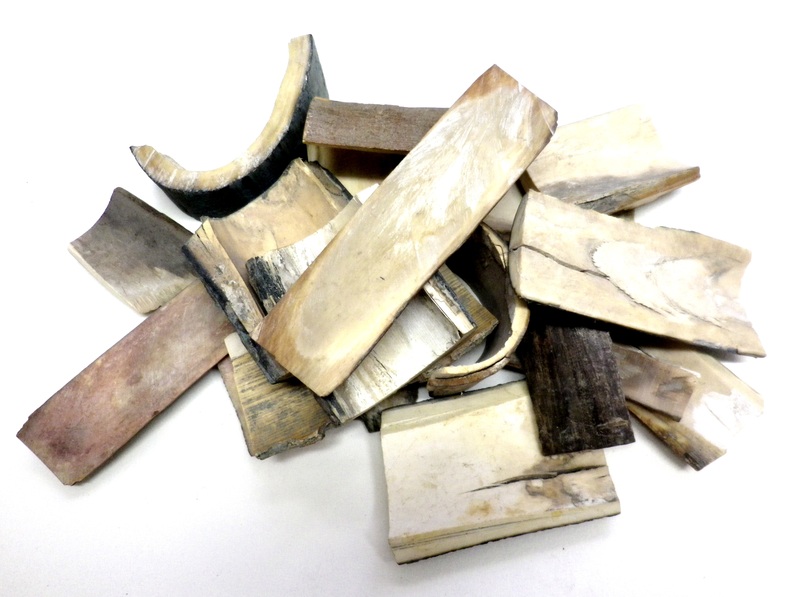 Sergey sells a wide range of mammoth ivory of all qualities but you have to know what you’re looking for. If you want to avoid disappointment, its up to you to do your research and make the right choice. Remember: You only want top quality outer bark ivory that will sand down to a creamy white colour with no cracks that are too big to sand out. When looking at the ivory, look especially hard at the cut ends. They should be creamy white with no cracks running from the outside deep into the piece or you’ll sand the ivory away before you get a clean surface to Scrimshaw. Mammoth Ivory Cut End, Look For This Quality, Clean And White With No Cracks Is Best For Scrimshaw. Sergey is in Germany and ships mammoth ivory worldwide with a tracking number. He is very reliable. Warning: the USA is at the moment (2015) starting to ban Mammoth ivory in a few of its states. Be careful in Australia as each type of ivory has different laws on buying, selling and owning. Some has to be a certain age and the paperwork will test your patience. It took me months of searching to clarify the details of buying, selling and owning ivory. If you speak to an Australian official and mention ivory they generally think you’re referring to Elephant ivory and very few understand the details of the laws.